Fixing My Community Supplies Area! I cannot tell you how excited I am about this Before and After! My Community Supplies Area has been such a lifesaver with tables, but *wow*, was it ever a mess if every student needed the same color of marker-- duck and cover! With the help of Tracy from Creekside Teacher Tales, I was able to make this adorable marker station for around $20! 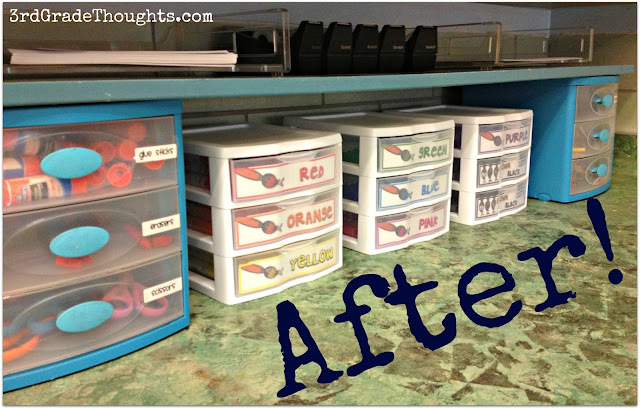 I taped these to the inside of the drawer, then sorted my messy tubs of markers into these nine, color-coded drawers. The results make me grin from ear to ear! That way, if a glue stick from their Table Supply Bins is dried out, they can quickly get a new one from these drawers without too much interruption. Same goes for erasers and markers. I also restrict the use of Table Bins so they can stay nice for when we need them for a class project, so this area does get a bit of traffic during Friday Free Choice Time if kiddos want to color, or during Ketchup & Pickle Time if a student needs to finish an assignment. The top board is just a shelf from the hardware store that I spray painted and on top, we store tape dispensers, lined paper, and white paper. 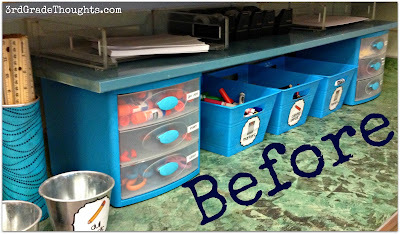 To the left, you can see my Sharp & Dull Pencil Bins (a freebie you can find HERE) and my ruler holder (tutorial HERE). 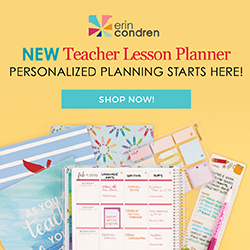 I hope this gives you some good ideas for your own Community Supplies Area and be sure to head to Creekside Teacher Tales to pick up this adorably cute freebie!! 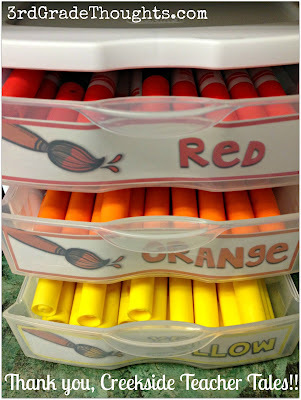 I just made spare crayon bins using this freebie today! I also beautified my room using many of your lovely chevron products, and am looking forward to launching both the Daily 5 and Math Rotations this year, thanks to your inspiration. Thanks! Yay! Great minds think alike ;) So glad you like the chevron- you'll have to send me pics when you're finished (3rdgradethoughts@gmail.com)- I'd love to see it all in action!! Hi Stephanie! I just wanted to take a moment and say thanks for all of your posts! 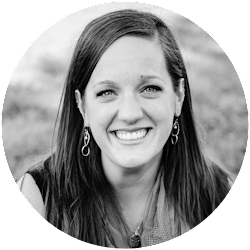 I am a newer follower, but you are quickly becoming one of my top blogs, a must visit each day! 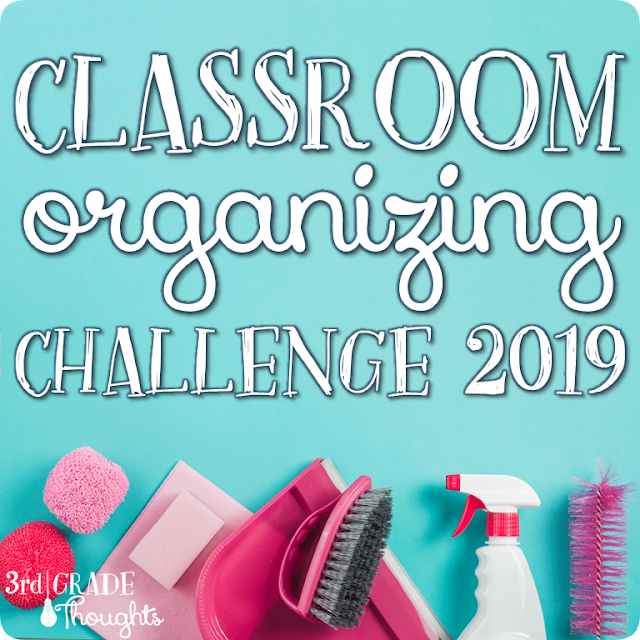 I am implementing math rotations this year with help from all your math posts and love all your organizational ideas. Thanks so much! Hello Stephanie! I am loving your posts while I work on my own classroom. I have a question, though. Did your teal drawers come that way or did you paint them? If you painted them, how? If they came that way...where from? Thank you so much! I like. I'm not 100% I have the room in my class, but that would be HOT! Great job. 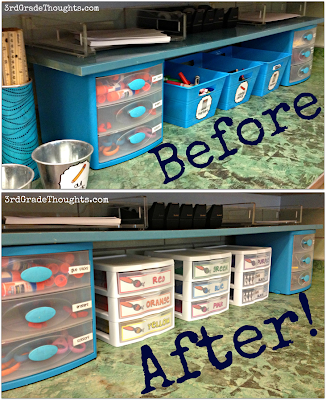 I love the idea of leveled storage. It is a great way to add more space to store materials.